The Israeli comedian Assaf Harel and the host of the show “Good Night With Asaf Harel,” used the monologue of his series finale on Monday to dive into a speech where he said Israel had reached a state of “apartheid” long ago. “Ever since the right-wing took power, more and more voices are warning of apartheid. Are you kidding? Apartheid has been here for ages. Ages,” Harel said. The message to the audience started with a description of Israel’s pleasant quality of life in contrast to that of Palestinians who live under occupation. “If you look at our life in Israel it’s pretty great. Yeah, it’s expensive, and we’re far from earning what we would have liked. Clearly, the healthcare system could be better, and yeah, the politicians could be more impressive and less embarrassing. But if you look at our life from a bird’s eye view, we’re doing pretty great,” he said. “But there are a couple of million people that we’re responsible for, and they’re in a horrible state. Infrastructure, food, healthcare, education. Millions who are living in abject poverty. Gaza is on the verge of plague, hours on end without electricity or water, Israel controls everything that goes in or out” Harel said. “Ever since the right-wing took power, more and more voices are warning of apartheid. Are you kidding? Apartheid has been here for ages. Ages. It’s just that we’re on its good side, so it doesn’t really bother us. We’ve been abusing the Palestinians on a daily basis for years, denying them their basic rights. “In Judea and Samaria [the West Bank] we’re taking their lands from them. Once, we used the Jewish National Fund to raise money to buy the lands. Today? We just pass a law saying we can just take their lands and that’s it. Soldiers shoot at stone-throwers because they’re a real threat, but if in Israel someone throws stones they won’t’ even be charged. Palestinian journalist are put on administrative detention, without trial, because they wrote something. Every time we have a holiday they’re under closure, God forbid they ruin it for us,” Harel continued. Harel concluded by arguing for the moment Israel’s right-wing politicians have succeeded in concealing the economic and moral cost of Israel’s occupation of the Palestinians. Harel said he believes this will change in time. “Israel’s most impressive innovation, more than any high-tech project, or Rafael weapon, is our amazing ability to ignore what is happening mere kilometers away to our neighbors,” Harel said. The Israeli daily Haaretz reported Harel’s show aired on Channel 10 and was recently canceled. “Good night” was known for its political content, and fined once for accusing Prime Minister Benjamin Netanyahu of capitalizing off of the death of his brother, Yonatan Netanyahu, a commando killed in the 1976 Operation Entebbe. In 2016 Harel received more than 300 death threats related to his liberal show. But of all of Harel comedic forays into politics, this “apartheid” speech was the first to grab headlines in English (and in German). LOL – this is what radicalizes people, ironically. I saw this pop up on Twistter and was stunned by how eloquesnt and frank this guy was. Thanks so much for highlighting this, Allison. I saw the video early this morning. The Walled Off hotel may sound utilitarian, even bleak. Its owner says it has “the worst view of any hotel in the world”, while its 10 rooms get just 25 minutes of direct sunlight a day. But, nestled against the controversial barrier wall separating Israel from the Palestinian territories, the West Bank’s answer to the Waldorf offers travellers something more elusive than any luxury destination. Link to hotel’s website~ great info and more pictures. 182 “Caritas” Street – love that — and, apparently a March 13 street party with Fatboy Slim? Really? Did I read that right? Maybe one of Mondoweiss’ contributors – isn’t Kate local? – can report on that. Video, please! I believe that Allison Deger is “local”. iirc, David Sheen and Dan Cohen are often in the area. So he wasn’t a Mutant Ninja Turtle? In one of the best performances of his legendary career, Robert Mitchum (The Night of the Hunter) plays small-time gunrunner Eddie “Fingers” Coyle in an adaptation by Peter Yates (Breaking Away) of George V. Higgins’s acclaimed novel The Friends of Eddie Coyle. World-weary and living hand to mouth, Coyle works on the sidelines of the seedy Boston underworld just to make ends meet. But when he finds himself facing a second stretch of hard time, he’s forced to weigh loyalty to his criminal colleagues against snitching to stay free. * The commentaries on most of the Criterion DVDs are outstanding! It’s very good but Israelis are going through a mass trauma experience, manipulated by assholes like Netanyahu. The problem is in their heads, far from reason. “Almost every Israeli in the last 47 years has done military service in the territories. Almost all of them have had to do things that go against human decency and morality – often not for the sake of Israel’s security at large, but to protect some isolated outpost of settlers. If indeed Israel were to reach peace with the Palestinians and the Arab world, most Israelis would have to live with the painful realization that most of what Israel has done to the Palestinians was unnecessary; that Israel could have ended the occupation a long time ago; and that the energies and resources invested in the West Bank’s colonization could have been invested in Israel’s flourishing instead. Doesn’t Israel have entire generations to throw into the maw of bad decisions and policy, only to reverse itself, write them off and go on? It’s sort of a basic requirement for that kind of colonial-occupation thing. Once again it is the jester who tells the truth. Most of us feel that way about our own pollies. MY REPLY: One good video deserves another (which happens to just be audio). Not to be confused with Autarchism. [EXCERPT] Autarky is the quality of being self-sufficient. Usually the term is applied to political states or their economic systems. Autarky exists whenever an entity can survive or continue its activities without external assistance or international trade. If a self-sufficient economy also refuses all trade with the outside world then it is called a closed economy. Autarky is not necessarily an economic phenomenon; for example, a military autarky would be a state that could defend itself without help from another country, or could manufacture all of its weapons without any imports from the outside world. Autarky can be said to be the policy of a state or other entity when it seeks to be self-sufficient as a whole, but also can be limited to a narrow field such as possession of a key raw material. For example, many countries have a policy of autarky with respect to foodstuffs and water for national security reasons. . .
Ossain is one of the Orishas that is part of the Candomblé religion. As said in the article tittled Candomblé this religion was originated in the city of Salvador which is the capital of Bahia. This religion is based on the rituals that are performed by the Orishas. Another component of this religion is rituals and offerings. This religion was founded with the understanding of the African priests. Candomblé was not a very well known religion and even the Catholic Church did not accept it. Regardless all of the withdraws this religion faced it was able to survive and nowadays many of the attributes, gestures, movements are still present in the 21st century. As said in the internet source named, Ossain or Ossaniyn, Ossain is well known as being the God of the herbs; he had the power over the medical leaves. He did not like to work with plant that grows from a garden; he only works with the wild plants. Also as describe as the Herbalist Warrior because not only does he use the plants for the benefits of others he also uses them to make the poison that people use for their arrows in order to defend themselves from the enemies. Not only is he such an important god, but without him no ceremony can take place. His presence is needed while a ceremony is taking place. Ossain knows the power that many herbs have, for example some of the herbs help people with having luck, misery or accidents. Many of the other Orishas did not have any power related with the plants, this means that they depended on Ossain to have a healthy life. Ossain seems to be one of the most important Orishas and plays the role of being the curer of all the other Orishas. In a way this means that he plays the role of a doctor as it would be called nowadays. Although he is in chanrge of looking out for the health of the other Orishas not all of them seem to be gateful. 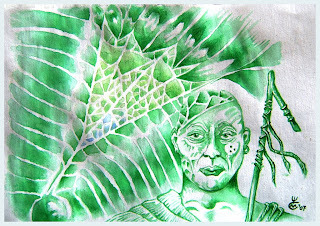 This was the case with the Orisha named Xangó who get the possession over Ossain’s leaves. This gives the understanding that some of the other Orishas may have envy his power to the point that they wanted to have the power and to know the secrets of cure that is behind the leaves. Ossain is the one and only owner of the knowledge that it is required to have in order to released the power and benefits of the leaves. Because he is the only one that knows the secrets of the leaves he has become a figure to be well known as not only a doctor, but also as a doctor. . . I am amazed!! Is this person still alive?? After four years of experience in Israel, to say this all aloud in TV, sounds like a suicide to me.. ?? It is everything true of course, but to admit it out loud.. A suicide..
He’ll be welcome to seek for asylum in Finland, if things get too bad for him in Israel..
Truthful, eloquent, sincere–liberal Zionism at its best. Sure, Sibiriak. It’s the language of those who did the invasion, the partition, the Nakba, the wars of 47, 56, 67 and 82 not to mention minor ones –all the while talking correctly and “with a human face” and perpetuating talks about talks. Liberal Zionism is much more dangerous than the authoritarian variety: it can perform endless negotiation while performing genocide unopposed. This is great! It is nearly perfect. Unintentionally, I believe, it reveals how successfully the system has managed to brainwash everyone in Israel including Assaf Harel himself. His focus is on the Occupied Palestinian Territories. But Apartheid is in practice against the 20% Palestinian minority of Israeli citizens since Israel was established. And when Assaf lists the human rights organizations targeted by the new Israeli law he lists three mainly Jewish Israeli NGOs. He forgets Adalah, the most active in Israel and internationally in defending the Palestinian minority’s rights. This is not to blame or to belittle what Assaf says here but to show how right he actually is even in ways he doesn’t intend or realize. What he skipped or didn’t know actually nails it as one of my Jewish Facebook friends commented on this note when I posted it there. Here is a little mental exercise – what would happen if an American comedian with a show (say someone of Jon Stuart’s stature) was to make the same rant? can we even imagine the aftermath? Also, how many of us would dare share this on our own facebooks? just wondering…. I can see how you could come to that conclusion but I instinctively disagree. What Assaf said about Israel , the occupation,the blockade and Apartheid was clinical,brutally honest and reflected a person IMHO who could not be”brainwashed” in any way about the discriminatory laws and practices in Israel itself. I think he may have chosen to focus on Gaza and the Occupied Territories simply to evade the usual Zio deflection riposte of “Apartheid – what Apartheid. Israel is a fully Western Style Democratic State and all our citizens irrespective of religion or race have full rights including voting rights”. You will have heard this normative Ziocrap ad nauseum in the past. As for the HR organisations he mentioned again I think that he was trying to remind fellow Israelis that there are other moral and right thinking Israeli Jews who are driving Israeli Jewish HR organisations which have long recognised their country`s HR abuses and Apartheid practices and are continually fighting to bring them to the attention of not just the world but to Israelis themselves. It would be nice to know, if this story continued somehow: Was he able to raise some discussion?? Or was he maybe silenced to death, or faced with full rage.. ?? Is there someone here who speaks hebrew and is there for able to follow the discussion inside Israel?? I would be interested in hearing, if this “speech” had any influence on anything.. I wish it had.. ! !